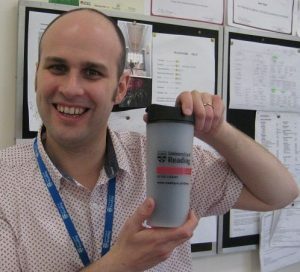 Systems Manager, Sam Tyler, will be celebrating with fizzy pop in his branded Library travel mug once Library systems are all successfully updated in July. This summer the Library is upgrading its Library Management System in order to gain a more robust system and maintain its security. However, please be aware that there may be some disruption to Library services whilst we are setting this up on Monday 3 to Tuesday 4 July and Monday 17 to Tuesday 18 July 2017. If you plan to use the Library on these days, either in person or online, please check our University Library News blog nearer the time to see how the system upgrade could affect you. The Library will remain open throughout, as will most of our systems’ functionality. We hope that you have a great summer and are looking forward to a new upgrades as much as we are! This entry was posted in Borrowing and viewing material, General news, Opening hours, Vacation information. Bookmark the permalink.